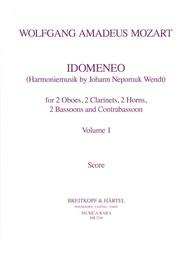 Idomeneo Band I composed by Wolfgang Amadeus Mozart (1756-1791). Edited by J. N. Wendt / E. James. Arranged by Wendt. For wind octet. This edition: paperback. 192 pages. Published by Musica Rara (BR.MR-2248).ISBN 979-0-004-48793-8.